Fifty years after it’s television debut, Thunderbirds launched once again this year as ITV brought back the cult programme using a combination of CGI animation and live-action model sets. Despite its new high-tech look the production retained all the qualities that made the original series a worldwide success. Strong characters and great adventure stories and this time no strings attached have seen the series spread worldwide like the original and cross the generation gap. With the stories focused around the Tracy brothers it’s fitting that another team of brothers, Ben and Nick Foster have taken on the job of providing new music for this seminal series. 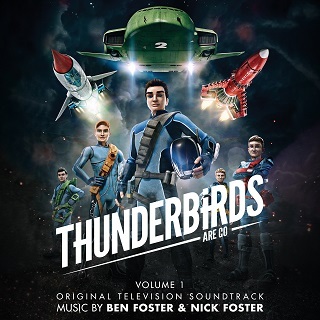 Facing the daunting task of following in the footsteps of the original and prolific Thunderbirds composer Barry Gray the duo have followed the same route employing a full symphony orchestra , adding modern touches to bring the sound completely up to date but retaining reverence for the original. Ben is a three times BAFTA nominated composer whose scores include Torchwood and Hidden Kingdoms and an orchestral arranger and conductor for 99 episodes of Doctor Who. Brother Nick is a BAFTA winning composer whose work includes The Cube and Derren Brown Specials. 7. The Hood – He’s Back! 21. No Thanks, Metal Man ! 32. It’s A Runaway !